When choosing a new pair of jeans, you should be aware of the body type you have. This doesn’t refer to the waistline alone, which should also be kept in mind, but to the structure of your torso. The build is classified into three types; slim, medium and heavy. Another thing to consider is your height. Taller people look good in most regular and straight leg jeans. Shorter people should consider medium or high rise jeans and straight leg cuts. 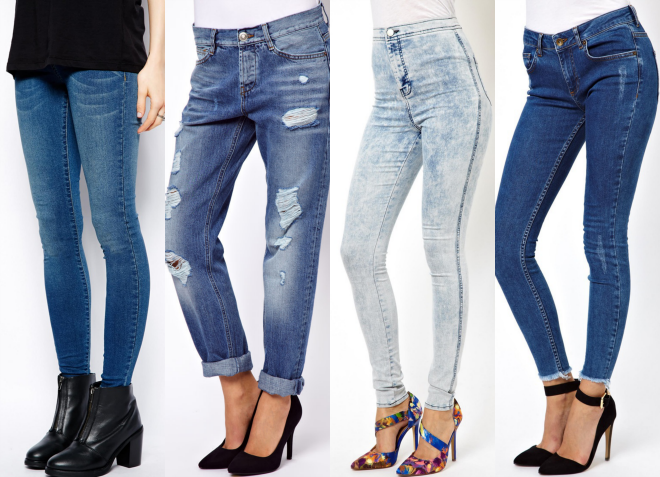 With those factors in mind, let’s look at the different types of jeans. 1. Straight Cut has equal leg width from waist to leg openings. 2. Slim Fit was designed to accentuate the thighs and buttocks. 3. Skinny was designed to be tight-fitting from top to bottom so that the shape of the legs can be seen. 4. Relaxed Fit is almost similar to straight cut but is slightly wider at the thighs. 5. Boot Cut was designed to accommodate the wearing of boots that is why the space is wider below the knees. 6. Flare Leg has a wide cut below the knees but fits waist and thighs snugly. 7. Stretch are tight-fitting to create the illusion that the person has toned buttocks and thighs and a flat stomach. 8. Loose Fit accentuates the buttocks and fit the waist snugly but the legs have a straight cut. 9. Capri has leg openings just below the knee. They are longer than shorts. 10. Cropped or Cuffed are longer than capri. Cropped hides three-fourths of the legs while cuffed has folded leg openings. Rise refers to the distance between the waist and the crotch of the jeans. 1. Low Rise jeans sits low or below the hips. 2. Medium Rise jeans sits slightly higher on the waist. 3. High-Waisted jeans sits high on the waist and can hide big bellies. 1. Raw Denim is unwashed, stiff, and dark in color. 2. Acid Wash uses pumice stones and chlorine so that there is a contrast in the color of the fabric. 3. Rinse Wash softens the fabric ad washes off residual dye. Applying starch strengthens the warp. 4. Mid Wash removes more dye in the fabric than rinse wash. The fabric becomes soft and has a light blue color. 5. Light Wash creates a very light blue color because the washing process is longer. 6. Dirty Wash creates a well-worn or distressed jeans. There is a yellow or brown tint. 7. Stone Wash washes dried jeans in a washing machine with volcanic rocks or pumice stone so that the material looks faded. 8. Bleach Wash uses bleaching products to alter the blue shade of the fabric. 9. Black or Grey uses a different dye than the indigo-colored jeans. 10. All-Over Tinting is done to make changes in the indigo hue. Direct dye is used and then fixed. 11. 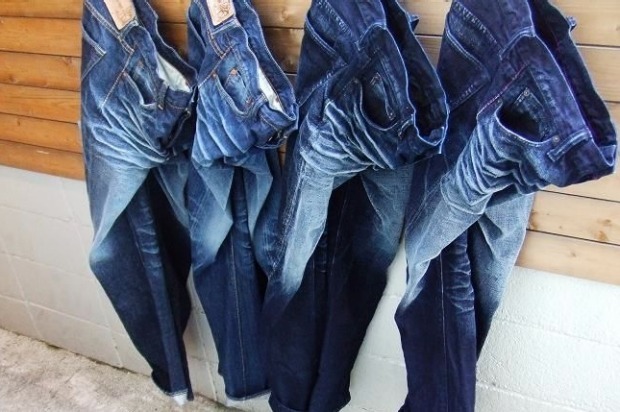 Coated Denim uses a coating of polyurethane to make the fabric last longer. 12. Vintage Finishing has a worn look. The fabric is sprayed with bleach, scraped, and then whiskered.